CLEVELAND (AP) -- One year. That's all Juan Gonzalez wanted to prove he was still one of baseball's best players. And the Cleveland Indians were more than happy to give it to him. Gonzalez, limited to just 115 games last season in Detroit because of injuries, signed a one-year, $10 million contract with the Indians on Tuesday. He'll fill the club's hole in right field and in the cleanup spot created when Manny Ramirez left. Gonzalez, who has had a history of back problems, passed a team physical before signing the deal, which includes a $14 million mutual option for 2002 and a no-trade clause. "Last year, I had a lot of health problems," said Gonzalez, a two-time AL MVP. "My production went down a little bit because of the injuries. But I'm going to come back and put up great numbers. I'm excited." So are the Indians, who lost 38 homers and 122 RBIs when Ramirez signed a free agent contract with the Boston Red Sox last month. 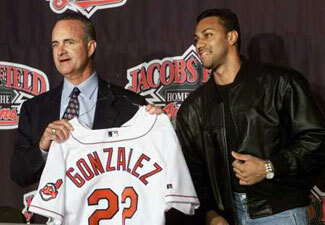 Gonzalez was a terror to Cleveland pitching as an opponent in Jacobs Field. He batted .344 (45-for-131) with 12 homers and 36 RBIs in 30 career games at the Jake. The 12 homers are the most ever by a visiting player at the hitter's-friendly ballpark. It's scary to think what he might do in a full season there. Sixty homers? 170 RBIs? Scott Boras, Gonzalez's agent, said he did a double-take when a study factoring in the ballclub's dimensions, Cleveland's potent lineup and Gonzalez's production spit out some scary numbers. Asked how scary, Boras joked, "268 RBIs." Boras was serious when he talked about Gonzalez's commitment to making things work in Cleveland. The 31-year-old outfielder struggled with injuries and an uncertain future with the Tigers last season, and hit .289 with 22 homers and 67 RBIs -- less than half his average the past four years. "Juan's decision to come here was very, very simple," said Boras, who said he negotiated with five other teams. "Juan could have gotten three times the amount of guaranteed money that he took from Cleveland. The reason he came here was to play for a winner. "He wanted to get back to an environment that allowed him the opportunity to win, and an environment where he felt there was a future. He wanted a winner." Boras said the mutual option allows either side to get out of the deal, and added it was unlikely he would negotiate a new contract with the Indians during the season. "It's like a life boat on an ocean cruiser," Boras said of the option. "You don't use them very often, but it's nice to know that they're there." Gonzalez turned down an eight-year, $143 million extension with the Tigers last year and then missed out on a big payday as a free agent this winter while both Ramirez ($160 million) and Alex Rodriguez ($252 million) got long-term deals. By signing with the Indians, Gonzalez feels he'll have the best chance to re-establish himself as one of the game's premium talents. And if things work out just right, he could finish his career with the Indians. "You always here about players going for the extra dollar," Boras said. "What Juan Gonzalez will stand for is a player who has turned down the most money to play in a place where he wants to win and is also willing to put forth the greatest amount of risk." Before agreeing to the deal, the Indians made sure Gonzalez's back wasn't risky. They gave him a full physical on Tuesday and examined test results provided by Boras. "His health and his back are non-issues," Indians general manager John Hart said. However, there were some other issues the club needed to sort out prior to finalizing the deal. Gonzalez has earned a reputation as being a moody player in the clubhouse. And like other high-profile pro superstars, Gonzalez often traveled with an entourage which sometimes included a personal trainer, spiritual adviser and others. "I can tell you that that has been addressed," Hart said. "There will be no one in the clubhouse." Boras said when Gonzalez approached him in August with a list of places he wanted to play, the entourage issue was discussed and put to rest. "Juan will walk into the ballpark like every other player and he'll leave the locker room like every other player," Boras said. "And anybody that's with him in his personal life will be outside the ballpark. It's something Juan and I took care of. A lot of things are said about Juan because he's shy." Except at the plate where the Indians are counting on him to fill the offensive void left by Ramirez. Gonzalez has never batted in a lineup like Cleveland's. He'll fit nicely into the No. 4 slot behind Kenny Lofton, Omar Vizquel and Roberto Alomar. He'll also be protected by Jim Thome, Ellis Burks and Travis Fryman. Playing at the Jake will help, too. He never got comfortable at Detroit's new Comerica Park and reportedly asked the Tigers to move the fences in. "The dimensions are better, not like in Detroit," he said. "It's too big for anyone. A lot of times, I hit the ball so hard and it didn't jump out of the yard." Cleveland gets to defer $2 million of his salary, paying $1 million each on April 1, 2002, and Oct. 1, 2002. He would get a $500,000 bonus if he is elected AL MVP, $300,000 for finishing second in the voting, $150,000 for finishing third and $100,000 for fourth or fifth. "This is a very important season for me," he said. "I want to stay healthy, play hard inside the lines and everything else will work out."